Creative's Super XFi headphone holography platform is expanding by the day - and its newest entry, the SXFI Air, is already making waves. In a few years, headphone holography will be the biggest thing in audio. Dolby’s working on it. Audeze has dabbled in it. And Creative, well, has already taken it to the next level. At last year’s CES Creative unveiled an ambitious new holography platform called Super XFi that could replicate the soundstage of a full surround sound system in a pair of over-ear headphones. It was a seriously impressive demo but required a specialized amp designed specifically for the show as well as calibration software only Creative had access to. One year later not only has Creative returned to the show with a Super XFi-enabled amp the size of a USB stick that went on sale earlier in the week, but it’s even found a way to incorporate the holography algorithm straight into a pair of wireless headphones. Those headphones are called the Creative Super XFi Air and, without a doubt, they’re one of the coolest pairs of cans at the show. The SXFI Air are really two products in one - a basic (but still good) pair of Bluetooth headphones and a Super XFi upconverter. We’ll cover the latter further down in the review, but let’s spend some time first talking about the vehicle for SXFI. These Bluetooth headphones are made from a supple faux-leather that covers the metal bridge with reinforced arms that lead to the earcups that are covered with a breathable mesh. The earcups have a bit of give to them, but that’s an intentional design choice to get a better seal over the ears. Along the outer edges of the earcups you’ll find an adjustable LED light that can be customized through the SXFI Air Control app that’s still being developed, as well as 3.5mm and microUSB ports that can connect to your PC or smartphone. Along the outer earcup you’ll also find buttons that power the headphones on and off, change the source (from Bluetooth to auxiliary to USB to SD card slot) and activate/deactivate Super XFi. There’s also a microSD card slot that, the company’s founder and CEO, Sim Wong Hoo says was put there on his insistence. While it might sound strange to see a microSD card slot built into the headphones directly, it seems like a surprisingly handy addition as it allows you to preload songs rather than streaming music from a smartphone. Last but not least, the headphones also support touch controls. Two taps on the earcup will pause your music or movie, while swiping up or down raises and lowers the volume. We had a bit of problems getting the touch control to work as well as we would’ve liked, but that might be a problem that more time with the headphones will solve. Of course, you’re not buying the SXFI Air because you want a pair of Bluetooth headphones - you’re buying them because you want faux-surround sound performance anywhere and everywhere you go. And on that promise, Creative seems to have delivered. While we’ve only spent a limited amount of time listening to them, we’ve so far come away impressed with the integration of the Super XFi holography platform into the over-ears: Watching Black Panther on our phone was a nearly cinematic experience in terms of audio performance and music had a significantly better sound than what we’ve heard on similarly priced wireless Bluetooth headphones. The one big problem we noticed, at least in terms of performance, was that using Bluetooth in a space as crowded with gadgets as CES did create some latency in the connection. That put audio out of sync with video and could be problematic for folks who are sensitive to it. The other problem, at least at this stage, is that while the end-result is an admirable one, the setup process can be a bit… well, tricky. For starters, for Creative to make the most of its Super XFi technology, it needs to scan the shape of your ears using your smartphone. Because you can’t see your ears when you’re facing forward it’s a pretty hard process to do by yourself and even with a friend can take a few minutes. The setup process also requires the Super XFi App as well as an app specifically for the SXFI Air. Creative’s CEO says that the company will combine the two apps when the headphones are released to the public sometime next month, but right now the Super XFi App - which is needed for the company’s already released Super XFi Amp - isn’t available on iOS. This is something that will be fixed down the road, but it’s definitely worth cautioning before you or your iOS-loving friends invest in Super XFi. While Creative still has some kinks to work out, the SXFI Air is one of the most compelling pairs of headphones at CES this year. 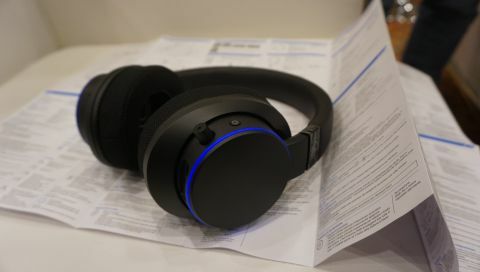 Its holography tech is both novel and supremely useful in bringing a larger soundstage to closed-back headphones and puts them on par with surround sound systems. Moreover, their multitude of input options ensures that connecting them to any and every device you own shouldn’t be a problem.